At the intersection of art and technology. At Wes Bender Studio we believe you should enjoy the music you love whereever and whenever you desire. Let's face it, that's not always possible. It might be that your lifestyle precludes you being able to have a traditional audio system or perhaps you're not able to listen at volume levels that allow you to get into the mix. Whatever the case may be, headphones are a solution. We're thrilled and proud to represent what we believe to be the finest planar magnetic heaphones currently available—Audeze (pronounced to sound like odyssey). All Audeze products are hand-crafted in the United States by audio engineers in California. Headphones are great because they take a traditional listening room (and all of its inherent sonic challenges and anomalies) out of the picture. With headphones, you're hearing a more accurate representation of the music performance because your own room isn't able to add its own sonic signature to everything coming out of the speakers. Planar magnetic designs are special, BIG for a reason and have advantages over traditional dynamic designs—ones that truly enable you to experience music through headphones as never before. Audeze has 4 models—available in different finishes. All come with their own travel flight case. Give us a call or drop us a line to schedule some time to experience Audeze. 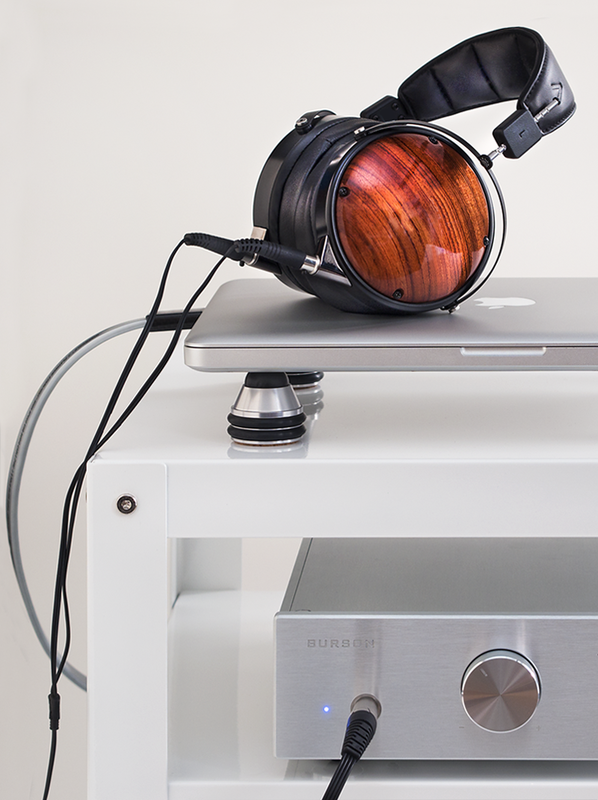 We recommend driving the Audeze Planar Magnetic headphones with an external headphone amp. We're especially fond of Burson Audio and CEntrance headphone amps. Burson Audio for your home and CEntrance when you're on the go. Experience Audeze headphones with Burson Audio and CEntrance here at the studio. The LCD-2 is Audeze's original game-changing headphone, the design that catapulted them into the spotlight. It's the most forgiving of bad recordings and presents a beautiful sound with the same powerful bass as all Audeze headphones, as well as a tonally-rich midrange and a simply beautiful treble region. The addition of their patent-pending Fazor technology makes the LCD-2 sound even more dynamic and focused top to bottom. It takes a real effort not to enjoy music on these headphones. The LCD-X is a very efficient headphone that extracts the maximum power out of low-powered amplifiers and portable devices. It’s the most neutral of the LCD Collection and favored by recording engineers and musicians alike for its fast, dynamic and accurate playback. Audeze's proprietary technology eliminates the breakup modes found in other designs improving focus and clarity. Patent-pending Fazor elements guide and manage the flow of sound for improved frequency extension and a more enveloping soundstage. The X and XC are sensitive enough to be driven directly by portable players like iPods, iPhones, and the better smartphones but an external amplifier produces better results. Responding to many requests for a closed-back version of their headphones, Audeze designed a new transducer that was subsequently placed in the LCD-X. The closed-back LCD-XC offers all the benefits of the LCD Collection’s open designs but closed-backs isolate the listener and reduce ambient noise. The bass is phenomenal and if you’re a DJ or studio engineer the LCD-XC is definitely the headphones for you. Like all Audeze headphones the LCD-XC is equipped with Fazor technology it’s sensitive enough to be driven directly by portable players like iPods, iPhones, and the better smartphones but an external amplifier produces better results. Audeze’s flagship headphone has literally been called the best in the world. The LCD-3 has the longest voice coil and the strongest diaphragm driving force that yields the fastest transient response of all the LCD designs. At the pinnacle of Audeze's LCD Collection, the LCD-3 delivers the highest resolution music experience they offer. Patent-pending Fazor elements guide and manage the flow of sound in the headphone for improved clarity and focus, greater frequency extension top and bottom, and remarkable 3D holographic imaging. The LCD-3 must be driven by an external headphone amp or integrated amplifier.